Tutorial Diary is an online destination for Company Specific Preparation and Tutorials. Tutorial Diary provides jobseekers a complete analysis of placement processes of various companies compiled by people who have already been placed in various companies. You will get most of IT Companies placement insight with Company profile, Job profile, Latest placement pattern, placement or selection process, latest placement papers with solved Answers, Important questions for practice, mock test papers,interview questions & answers, tutorials and preparation materials. In this section we provide information about companies you want to work for. In this section you will know about mission, vision, locations and facts of the specified company. In this section we provide information about the qualities that a company seeks in a candidate to find him suitable for the position. In this section we provide information about the pattern of the test conducted by the specified company and important topics to study. This section will cover tips to get success in the placement process of specified company. 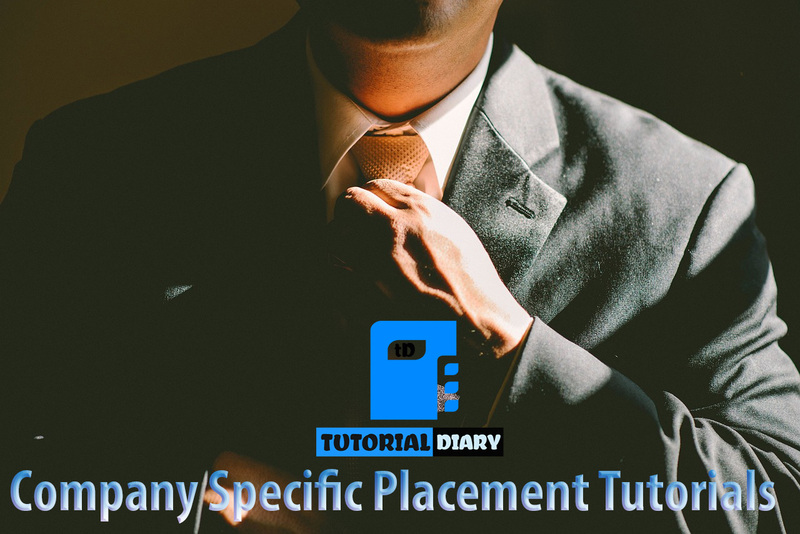 This section provides you a collection of tutorials to prepare you for the placement in the specified company. Topic wise solved questions to make you aware of questions and answers asked in the specified company. Practice makes a man perfect. So, practice questions to solve so that that it build a concrete concept. Pre tests to check your preparation towards the specific company. Note: If you don't find any company here in the list please leave a request in this page below or leave a message or suggestion in the contact section. Also you can help others by contributing others by sharing your experience, questions, tutorials, latest pattern etc. of a placement you attended by going to contribute section or simply leaving a message at contact us page. Below is the list of latest collections of Placement Preparation and Tutorials for different IT Companies. We tend to frequently update the Company Specific Preparation Tutorial with change in pattern, questions to provide job seekers updated preparation for IT company jobs in India.